What Is a "Microsoft Account"? - Ask Leo! What Is a “Microsoft Account”? A Microsoft account is almost any account you have with Microsoft, and there's a high likelihood you already have one. Windows 10 wants me to use a “Microsoft account”. I’ve had a Hotmail account for years, is that the same? Different? Do I need to create yet another account to keep track of? Many people are confused by the concept of a “Microsoft account”. Microsoft introduced it around the time of Windows 8; with the arrival of Windows 10, they’re pushing the concept even harder. I’ve long held that Microsoft just doesn’t do product names well, but in this case, they had no choice. They needed a term for a more general concept. Your Hotmail account already is a Microsoft account – as are many, many other accounts. That’s where people are getting confused. If you have an email address that can be used to log in to Outlook.com, that’s a Microsoft account. … and probably a few others I’ve missed. Over more than twenty years, Microsoft has offered a number of services that involved using an email address they provided. All of those are now Microsoft accounts. So what’s a Microsoft account? The short version is this: it’s a single account you use to access any and all Microsoft services. Since Windows 8, you can also use it as your Windows login1. You can have more than one if you like – perhaps to keep some services separate from others – or to keep your Windows login separate from your online identity. Just go to a Microsoft online service like Outlook.com, sign out, and then begin the new-account creation process as if you didn’t already have one. Creating a new Outlook.com account is, in fact, creating a new Microsoft account, which happens to use email addresses ending in “outlook.com” as your login ID. Microsoft Passport – an attempt to create an internet-wide single log-in using your Microsoft email address. MSN – the MicroSoft Network – was originally a service providing internet connectivity. MSN evolved into a family of online services and content sites, once again with a single login using your Microsoft-provided email address. Windows Live – essentially a rebranding of the MSN name, focusing on those online services, and at the same time providing some integration with Windows itself. If you had an account under any of those names, it’s now a Microsoft account. One of the more common questions I get is how to close a Hotmail account (or an Outlook.com account, or an MSN account, and so on). People get frustrating with something – perhaps the amount of spam they’re getting, or sometimes they’re trying to stop email from a particularly nasty sender. I get it. Closing an account seems like the way to solve problem. Unfortunately, what most people don’t realize is that you’re not just closing your email account; you’re closing your Microsoft account and losing access to all the other services associated with that account. Do you use Skype? OneDrive? XBox? If you login to those using the same email address, they’re the same account, and they’ll be closed as well. There’s no way to close just part of the account. Particularly with Windows 10, Microsoft has been pushing hard for people to use their Microsoft accounts to log in to their machines. In fact, some Windows 10 features aren’t available without one. From Microsoft’s point of view, it makes a lot of sense, both business and technical. From the business side, it allows them to establish a longer term relationship with you than just installing Windows – it makes it easier for you to use other Microsoft services in the future. From the technical side, it actually solves an interesting problem: if you can’t log in to your Windows machine because you forgot your Microsoft account password, you can simply use any or all of the online infrastructure to reset that password. Go to Outlook.com, for example, and change your password or recover your account. Once complete, that same password gets you back into your Windows machine (if you’re using a Microsoft account to log in). Regardless of how you feel about it, Microsoft is pushing hard to get everyone using a Microsoft product of any sort to have a Microsoft account. The good news is, you likely already have one. 1: Perhaps eliminating the need to remember yet-another-password. 2: Don’t close your account. Just don’t. Solve whatever problem you’re attempting to solve some other way. « Previous post: How Long Should I Keep My Backups? If you have a Hotmail email address then you have a Microsoft account. And Skype is Microsoft as well. So that is your Microsoft account. My Microsoft account is my personal email address, on a domain I control. When I registered as an OEM with Microsoft many years ago, I entered this address and continue to use it today. But Microsoft has no control over it. I also use it for Skype. This Microsoft account scenario is enough to confuse any reasonably computer literate person. I had a bad experience a couple of years back when I used my Microsoft account to log onto my computer. My Internet access was damaged as an unrelated problem, and as a result, I could not log in. It took me a while to fix that problem. Since then, I don’t use Microsoft account to log in. I was “forced” in to this Microsoft Account scenario after upgrading to Windows 10, but I don’t like it. I’m seeing a lack of privacy with this. Interesting situation recently. I was helping an old lady with a problem on her Windows 8 computer, and I needed to restart her machine. She quite freely gave me the password, and when I saw the username on the computer I realized she’d just essentially given me her email account access. A few details in our conversation following, showed me that she uses the same password for a number of sites also. Fortunately I’m an honest man, and have “forgotten” that very easy password as soon as I left her house. But if she had to take that machine to a stranger at a tech shop and give them her password to work on her machine in her absence, just imagine where this would lead. I have passwords for three other people, derived from similar circumstances, but they’re close relatives who depend on me. This old lady was not a relative, and I don’t like this. Windows 10 also allows you to switch to logging in with a PIN instead of a password. That way, if you leave the computer with a technician, you only give them the PIN which can only be used on that computer. You could then easily change it when you get it back. Unfortunately, your options are limited. If you do not have recovery options set correctly in your account, you may not be able to recover it. If you do have recovery options set, then you’ll need to carefully read and follow the instructions for your accounts. 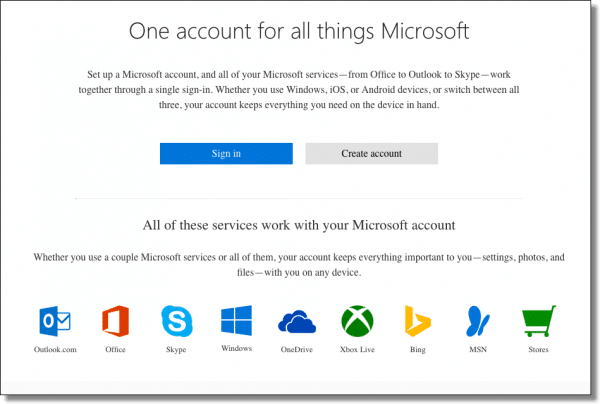 I would suggest re-reading this article first to make sure you thoroughly understand what a Microsoft account is, and how it works. Can you clarify? What is confusing?